I use the RSS feed as it allows me to read it easily wherever I am. 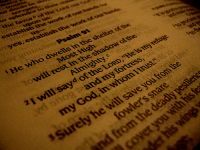 The big advantage of this RSS feed over many others on the internet is that the full feed of the bible text is included. The RSS feed also allows you to subsribe to a podcast so you can listen to the bible.